I believe that when you give your body what she needs and take away what causes her harm, you no longer have to fight with her to find lasting hormonal health and happiness. She will naturally stabilize her weight, mood, and energy so that you can stop focusing on dis-ease and discomfort, allowing you to live a life free from painful cycles, low libido, digestive discomfort, symptoms of PCOS, and decreased fertility. Together we can transform your health by focusing on healing the body through gentleness, self-compassion and self-care, the latest nutrition research, and time-tested, evolution-based dietary concepts. Thank you for taking time for your health. I can’t wait to meet you! Caitlin is one of the most well informed and inspiring women I know! I have done several workshops with her and she is incredibly well prepared, well spoken and a joy to be around. She has so much information to share and does so in a very accessible way. Her enthusiasm and passion for her work is infectious. I often recommend people to go to her, I trust that she'll take very good care with them as she has with me. We love you Cait! Caitlin is an inspiration to all, no matter the stage of ones health journey. She approaches her clients without judgment and eases fears and misconceptions surrounding the world of nutrition! She is dedicated to continued research in her field and is constantly up to date on new and upcoming information! She has helped motivate me to seek and maintain a healthy lifestyle through diet, exercise and self-care. Caitlin is always approachable, available and knowledgeable! Caitlin is an inspiration to all, no matter the stage of ones health journey. She approaches her clients without judgment and eases fears and misconceptions surrounding the world of nutrition! She is dedicated to continued research in her field and is constantly up to date on new and upcoming information! She has helped motivate me to seek and maintain a healthy lifestyle through diet, exercise and self-care. Caitlin is always approachable, available and knowledgeable! I attended Caitlin's nutrition class at Yoga at The Ridge and it was pure genius! I was already on a lot of what she talked about but she pumps it to a new level of imagination and enthusiasm. 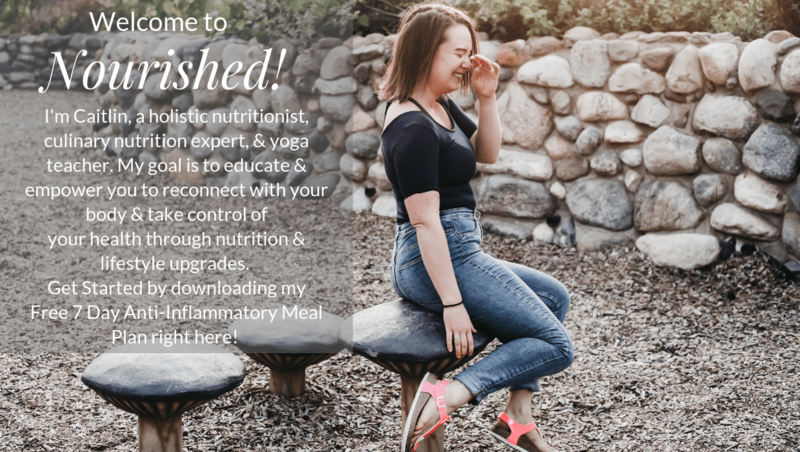 She really knows her stuff and communicates it in such a kind way that no one ever feels shamed about their food choices- it's all about eating "nutrient rich" foods. Thanks!